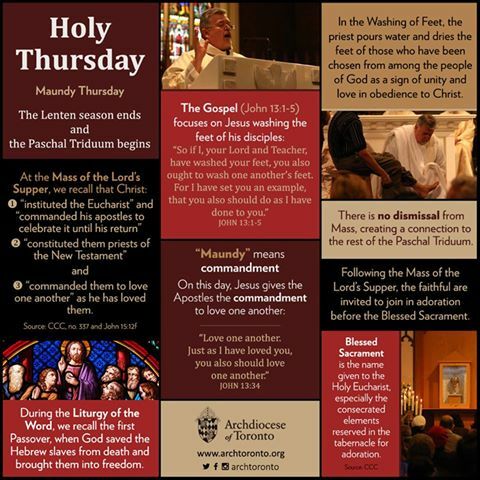 Holy Thursday is also called "Maundy Thursday"? "Maundy" comes from the Latin mandatum. John 13:34: "Mandatum novum do vobis ut diligatis invicem sicut dilexi vos." "A new commandment I give unto you, That ye love one another; as I have loved you." 35. The Chrism Mass which the bishop concelebrates with his presbyterium and at which the holy chrism is consecrated and the oils blessed, manifests the communion of the priests with their bishop in the same priesthood and ministry of Christ. The priests who concelebrate with the bishop should come to this Mass from different parts of the diocese, thus showing in the consecration of the chrism to be his witnesses and cooperators, just as in their daily ministry they are his helpers and counselors. The faithful are also to be encouraged to participate in this Mass, and to receive the sacrament of the Eucharist. The chrism and the oil is to be used in the celebration of the sacraments of initiation on Easter night. The bishop celebrates a "Chrism Mass" and most of the priests of the diocese attend. 50. During the singing of the hymn "Gloria in excelsis" in accordance with local custom, the bells may be rung, and should thereafter remain silent until the "Gloria in excelsis" of the Easter Vigil, unless the Conference of Bishops' or the local Ordinary, for a suitable reason, has decided otherwise. During this same period the organ and other musical instruments may be used only for the purpose of supporting the singing. Chants accompany the procession traditionally "Ubi caritas est vera." with the gifts on Holy Thursday in the evening Mass of the Lord's Supper, and hymns to accompany the procession of the Blessed Sacrament to the place of repose; Traditionally "Pange lingua" or some other eucharistic song is used to accompany the Eucharist to the Altar of Repose. 51. The washing of the feet of chosen men which, according to tradition, is performed on this day, represents the service and charity of Christ, who came "not to be served, but to serve. This tradition should be maintained, and its proper significance explained. 54. After the post-Communion prayer, the procession forms, with the crossbar at its head. The Blessed Sacrament, accompanied by lighted candles and incense, is carried through the church to the place of reservation, to the singing of the hymn "Pange lingua" or some other eucharistic song. This rite of transfer of the Blessed Sacrament may not be carried out if the Liturgy of the Lord's Passion will not be celebrated in that same church on the following day. The chapel of repose is not prepared so as to represent the "Lord's burial" but for the custody of the eucharistic bread that will be distributed in Communion on Good Friday. After the Mass of the Lord's Supper the faithful should be encouraged to spend a suitable period of time during the night in the church in adoration before the Blessed Sacrament which has been solemnly reserved. Where appropriate, this prolonged eucharistic adoration may be accompanied by the reading of some part of the Gospel of St. John (chs. 13-17). From midnight onwards, however, the adoration should be made without external solemnity, because the day of the Lord's passion has begun. After Mass the altar should be stripped. It is fitting that any crosses in the church be covered with a red or purple veil, unless they have already been veiled on the Saturday before the Fifth Sunday of Lent. Lamps should not be lit before the images of saints.